The USSR was the red dog; the US is the white dog. From Pakistan, A Hard Country by Anatol Lieven. The enemy of my enemy is my friend. Not necessarily true, but often used to justify US foreign policy. Before and after WW2, Stalin’s Soviet Union was our enemy, but during the war we were allies against Hitler‘s Germany.When Iran and Iraq were at war, we were friends and suppliers to Saddam Hussein‘s Iraq. After that war concluded, we became Saddam’s enemy and then found it necessary to invade the country in 2003.By doing that, we nearly touched off a civil war in Iraq and it still may happen. We learned in Vietnam to stay out of civil wars, and now some in the US are advocating that we become involved in the Syrian civil war. BAD IDEA. We should let the Syrians sort it out. Just because some are opposed to Assad does not mean we should align ourselves with some or any of his opponents. In the contest called Afghanistan, the US has won (sort of). We outlasted the USSR in Afghanistan. Their war lasted 9 years while we are still fighting after 10+ years. The Soviet effort bankrupted the USSR and led to the dissolution of the country. The Afghan war has not bankrupted the US yet, but it is past time to declare victory and get out before we bankrupt ourselves. Forget about invading Iran or Syria. We can’t afford more wars now in our time of sequestration. The real victors in the Afghan war are the people of Afghanistan. They are undefeated against Alexander the Great, the British, the Soviets and now the Americans. The only outside victor in Afghanistan was an idea, Islam. If we believe that Afghanistan should adopt democracy and gender equality, then we must be patient and permit the Afghans to decide for themselves if and when they are ready for change. In the meantime, I suggest that we withdraw and then replace our military aid with humanitarian assistance. In the long run, that will provide a better solution for Afghanistan and for the US. Atlas Shrugged by Ayn Rand ( real name Alisa Zinov’yevna Rosenbaum), published in 1957 and at 1168 pages, about 1,000 pages too long. Posing as a novel, it is really an exposition by Rand in favor of unregulated and untaxed capitalism, a philosophy she dubbed objectivism. Rand was born in 1905 in Russia and emigrated to the US at age 21 in 1926 from the newly formed USSR. I believe that she was traumatized in her formative years by the Russian Revolution which occurred in 1917.
Who is John Galt? He is the hero of the book and embodies Rand’s philosophy. He does not appear in the book for the first 700 pages. Toward the end of the book, he explains Rand’s philosophy to the world in a radio address beginning at 8:00 p.m. Eastern time that I imagine lasted all night (she says 3 hours). Only Fidel Castro among world leaders currently alive could have rivaled Galt for wordiness. If he had been cast as an US Senator rather than an electrical engineer, Galt could have sustained filibusters by himself. 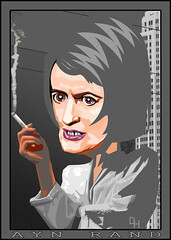 Rand’s characters are not believable, being less than two-dimensional. They scream rather than speak or shout and they are always smoking cigarettes. The novel? takes place mostly in the US, while the rest of the world is ruled by people’s states. The picture she paints of the US is a nation in decline and resembles the Soviet Union that she left. It is a shame that many of the current GOP leaders subscribe to her vision and philosophy. Paul Ryan and Alan Greenspan among others are her disciples.She favored Social Darwinism, survival of the fittest, starvation and extinction for the rest. Rather than read this book, I recommend reading or re-reading Orwell’s Animal Farm and 1984. In my opinion, more is to be gained from Orwell than Ayn Rand, and Orwell is more pertinent to our present situation. Orwell’s two books are available in one volume from Amazon.com at $15.00. Their combined length is only 400 pages, 1/3 the length of the Rand book which has the weight and size of a brick, and the readability too IMHO. When things wear out or break, good maintenance practice is to fix or replace them. When an individual or nation is short of cash or credit (broke), then maintenance is deferred. The US is in that position now. Devoting too much of our resources to defense and a sizable portion of the rest to social programs, we are cash-strapped to invest in education, research and infrastructure that will grow our economy in the future. We defeated the USSR in the Cold War, because we increased our defense spending to the point that they could not compete. Their economy cracked under the strain. We are headed in the same direction with China, but now we are the ones whose economy is showing the strains. If our economy grows at 2-3% per year and the Chinese economy grows at 9-10% per year, the simple laws of interest compounding ensure that they will have the capacity to grow all their expenditures, civilian and defense, at a faster rate than we can. It is my belief that we must grow our economy faster if we wish to remain a superpower. 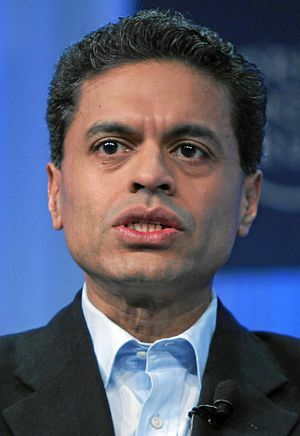 We will never grow our economy as fast as China does, but according to Fareed Zakaria, China is about to experience slower growth, around 6%, due to the sheer size of their economy. Therefore, the parties in Washington must stop their bickering and put our economy on a sustainable path to recovery. We have a more educated work force than the Chinese do. We should encourage everyone’s participation in the economy to reap maximum benefits for them and for the US.